Raspberry Pi display HATs are an easy way to add interaction to your project. Here, we take a look at some options. Raspberry Pis are useful little computers, employable in a variety of ways. When the HAT specification was announced back in 2014, many companies expanded the Raspberry Pi's flexibility by creating add-ons for the Raspberry Pi 3 B+. The HAT market continues to grow from there. Below are 5 Raspberry Pi HATs with integrated displays ranging from LED indicators all the way to touchscreens for headless Pi projects. The Display-O-Tron is a small 16x3 character LCD display with capacitive touch pads, GPIO breakout pins, and a six-zone RGB backlight. This screen and touchpad combination can come in handy for data logging projects where some user input is needed from time to time. It has many more nifty features along with the ability to interface with other sensors and boards through the selected GPIO pins. 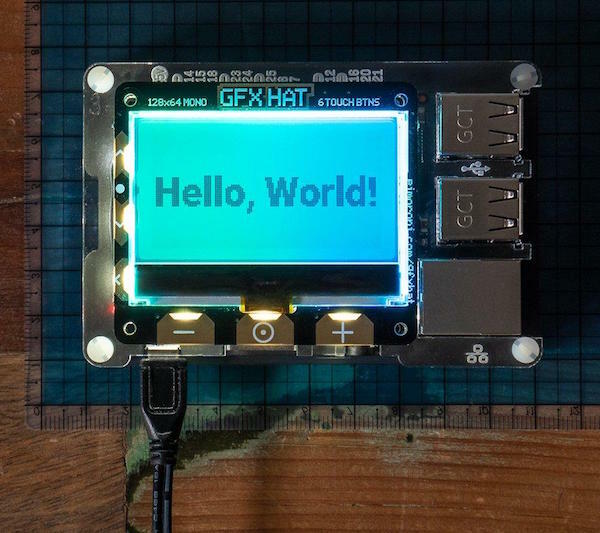 This HAT, successfully funded by a Kickstarter campaign back in 2015, adds an ultra-low power, high-resolution e-paper display to your Pi. However, it is easy to integrate with other microcomputers—even microcontrollers like Arduino. If you need a screen that is easily read in the sun and needs little power for the text, this is the way to go. Image courtesy of Pi Supply. Suitable for 3V or 5V power and logic. 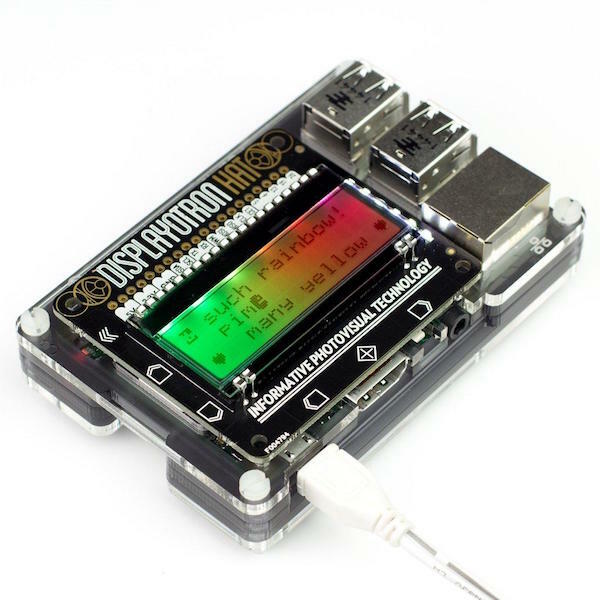 Use with RasPi, Arduino, BeagleBone, and more. 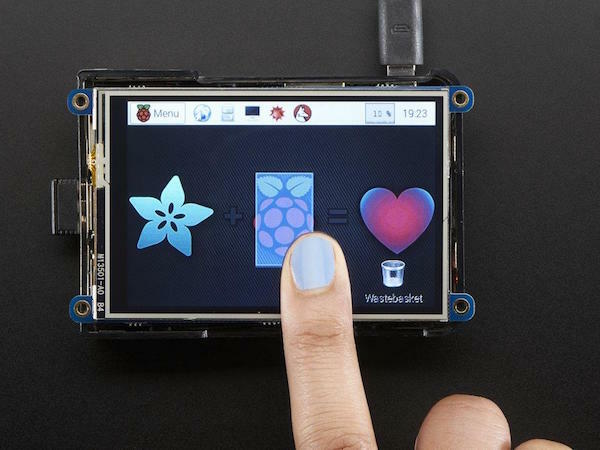 The 3.5" display fits onto any Pi with a 2x20 connector and features 480x320 16-bit color pixels along with a resistive touch overlay. The plate uses the high-speed SPI interface on the Pi and can also have an HDMI display connected. The display uses the hardware SPI pins (SCK, MOSI, MISO, CE0, CE1) as well as GPIO #25 and #24. GPIO #18 PWM dims the backlight. All other GPIO are broken out into solder pads at the bottom for you to use. The GFX HAT is the bigger, shinier brother of the Display-O-Tron. With it, you can add larger, more complex images to your projects and interact with them using the capacitive touch buttons. Ideal for an IoT project with headless Pis. 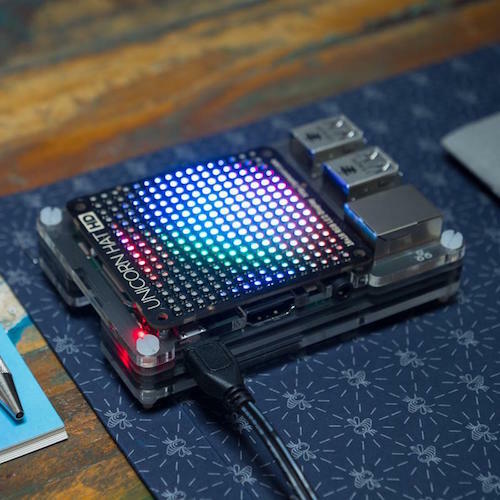 The Unicorn HAT HD is a ready-to-program 16x16 LED matrix, containing 256 RGB LEDs. Because it fits HAT specifications, it is a compact solution for projects needing a multitude of LEDs. The Python library makes it easy to use all of the LEDs, you can focus on the main parts of your projects. If you’re looking for a way to expand the capabilities of your microprocessor, these displays are a good place to start. After all, if you can’t tell when your scripts are running, how can you be sure they're running at all? Will you be using any of the HATs we've covered? Have we missed any great ones? Let us know in the comments!